On Friday, 10 April 1998, after 2 years of intensive negotiations, the British and Irish governments and the political parties in Northern Ireland approved a comprehensive political agreement - the Agreement reached in the Multi-Party Negotiations, also known as the Belfast or Good Friday Agreement. One of the institutions created under the Agreement was the British-Irish Council (BIC). It was formally established when the British-Irish Agreement (the Agreement which gave effect to the provisions of the Multi-Party agreement) signed by the 2 governments came into force on 2 December 1999.
to provide a forum for consultation and co-operation. Delegations widely welcomed the establishment of the Council at its inaugural meeting in December 1999. The formal purpose of the Council as outlined in strand 3 of the agreement is "to promote the harmonious and mutually beneficial development of the totality of relationships among the peoples of these islands... the BIC will exchange information, discuss, consult and use best endeavours to reach agreement on co-operation on matters of mutual interest within the competence of the relevant administrations". The Council normally operates by consensus, and it aims to provide a forum where members can have an opportunity to consult, co-operate and exchange views with a view to agreeing common policies or common actions in areas of mutual interest for the benefit of all. The Council includes members from sovereign governments, devolved institutions and crown dependencies. 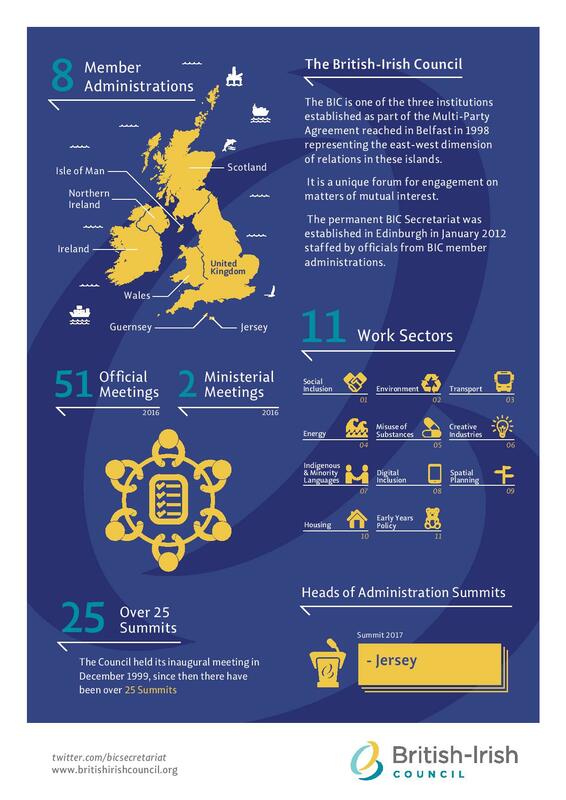 Membership of the Council comprises representatives of the Irish and British governments and of the devolved institutions in Northern Ireland, Scotland and Wales, together with representatives of the Isle of Man, Guernsey and Jersey. The Council is unique in that it is the only international forum in which these 8 members participate. All members act in accordance with their own democratic procedures and remain accountable to their respective elected institutions. The Council also hosts conferences, seminars and study visits for experts in particular fields, including for example the digital divide and social inclusion. Find out more about the work of the Council in our factsheet and infographic.